With the first and latest update in many years, the 2007 edition of the ANSI/ASME A13.1 changed the color coding requirements for the labels and markers on pipes. In this new edition of the pipe marking standards, they added some new colors. The new label color requirements are based on the characteristic hazards of what is in the pipe you are marking. See below! You need to place labels in a way that they can be seen from the ground easily. Employees need to be able to look at a pipe and know its contents directly facing them. Labels should affixed be near valves, branches, splits, near changes of direction, or at the entry and exit points in a room. Recommended spacing would be no greater than 20 feet on a straight run of pipe. See below for more information. 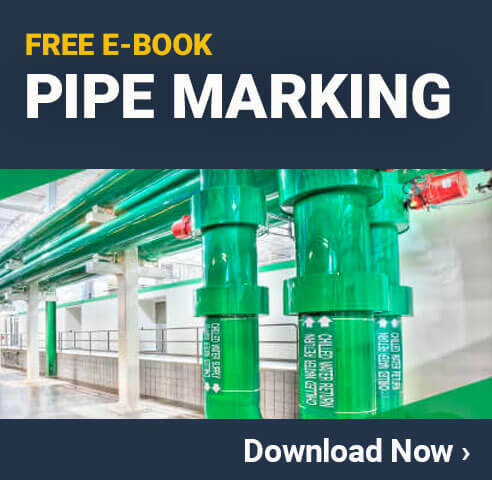 Pipe Marking labels must effectively communicate the contents of the pipes and give additional detail if special hazards (such as extreme temperatures or pressures) exist.